Nothing wrenches your heart more than those times when your baby is sick. Your entire world comes to a standstill. You cannot stop yourself from fussing over the baby’s needs; those sleepless nights, if the baby is warm enough, the visits to the pediatrician, and whether the baby is comfortable or not. Being a parent, it is miserable to watch your little cherub in pain; even more so when the baby is suffering from a cold-stuffy nose, sore throat, congestion and other such symptoms! What your baby needs during this time is more than the warmth and snuggles. Many parents these days are opting for humidifiers, especially in the cold winter months to make their baby’s and their life easier. Moist air from the humidifier helps loosen the baby’s congestion, eases in clearing the nasal passage, and soothes them to sleep at night. Humidifiers generally come in two basic types- cool mist and warm mist. 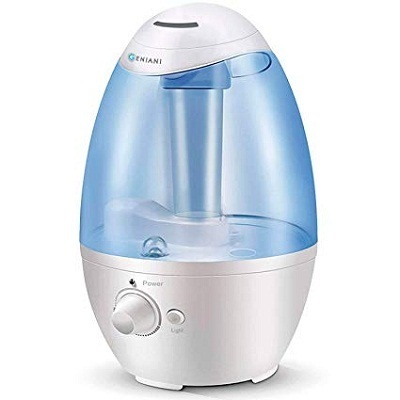 For babies and small children, using a cool mist humidifier is recommended by experts because warm mist humidifiers might be dangerous if your little one gets too close to it. To aid you in choosing the best humidifier for your precious one, we present to you 8 Best Humidifiers for Babies. 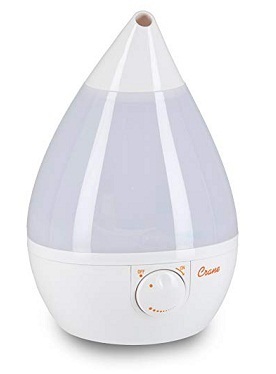 Ease your child’s nasal congestion with this stylish drop shaped humidifier by Crane USA. The hydrating cool mist from the baby humidifier increases moisture level in the air for easier breathing a good night’s sleep for your baby. It runs up to 24 hours and automatically shuts off when the water level is low. This award-winning humidifier effectively humidifies small and medium rooms up to 500 square feet and is top rated among parents. It is very quiet apart from the bubbles that come up occasionally. The nozzle on top is adjustable 360 degrees, so you can easily point it in the direction you would like the mist aimed. Additionally, the Crane Drop Cool Mist humidifier holds 1 gallon of water and fits under most bathroom sinks for easy filling. This humidifier for babies does not require a filter. It is made up of anti-microbial material which reduces mold and bacteria growth by up to 99.96%. It has an auto shut-off sensor which automatically shuts off the humidifier when the water level is low. Pricing point is a little on the expensive side. Homes with hard water might have to buy a separate filter for the unit. Due to its anti-microbial body which reduces germ growth, you will love how easy to clean and low maintenance the humidifier is. 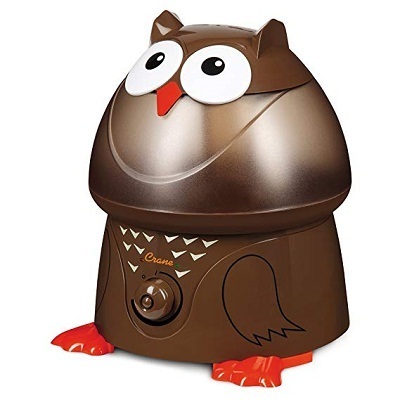 Help your baby breathe easy and sleep through the night peacefully with this adorable owl-shaped humidifier by Crane USA. Featuring an award-winning, child-friendly animal design and top-rated performance, this humidifier for baby congestion provide up to 24 hours of soothing moisture to help relieve the effects of dryness and congestion. 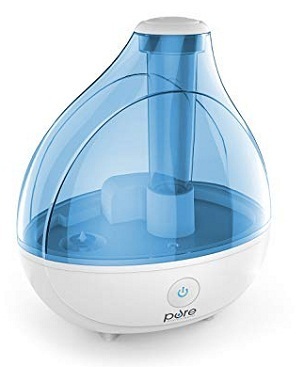 Not only is the humidifier adorable, but it is easy to use, whisper quiet, and has antimicrobial material in the base that reduces microbial growth by over 99 %. This BPA-Free and compact unit have ultrasonic technology that adds humidity to the air in the room. It includes a built-in auto-shut-off feature that engages when the water tank is empty to ensure safety. 1-gallon tank holds enough water which does not require frequent filling. Humidifier shuts off automatically when the water level becomes low. Makes a loud clicking noise when turned off. It leaves white residue when used with regular/ hard water. Apart from relieving your baby of cold and its symptoms, it helps ease the discomforts of dry, itchy skin and hair, chapped lips, nose bleeds and dry throats. Getting a restful sleep for your toddler becomes more easy with the Pure Enrichment Mist Aire. Its Ultrasonic Cool Mist Technology humidifier for toddlers safely moisturizes the air for up to 16 hours of continuous operation. High and low-speed settings make it easy to adjust mist direction and speed to fit your baby’s comfort level. It also comes with an optional night light which offers a soothing glow for maximum relaxation. The humidifier’s 1.5-litre tank delivers a moisture output of 150 milliliters per hour making it the perfect solution to relieve the symptoms associated with dry air. On the low setting, you can expect up to 16 hours of continuous and safe operation. One of the most silent operation humidifier. The nozzle swivels 360-degrees and can be positioned in any direction according to your needs. The tank is a little small with a 1.5-liter capacity. You will love the simplicity of this humidifier: no annoying filters to clean, no complicated features and it all comes at a great price. 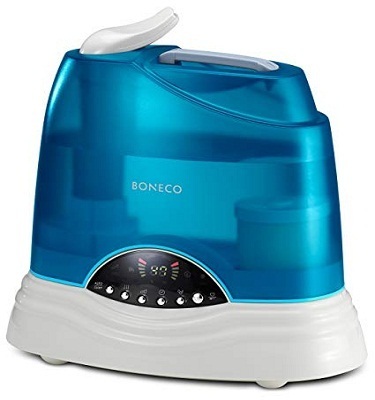 This cool moisture humidifier uses an antimicrobial filter and is an excellent humidifier for infants and kids bedrooms. This humidifier adds moisture to the air in the baby’s room to help your baby sleep comfortably, and the projector lights up the ceiling with stars for a comforting glow. It features a wide tank opening that allows for easy filling and easy access to cleaning. The humidifier maintains a 40-60% humidity level in the air which also reduces the survival of flu virus on surfaces. It has a wicking filter which draws water from the base while a fan blows the moisture out, helping it evaporate into the air more quickly. The filter also helps to remove minerals and pollutants from the water which is perfect for usage in hard water areas. The filters are anti-microbially treated to inhibit up to 99.99% of mold growth. The scent pad heater produces soothing menthol vapors for added comfort. Requires an additional wicking filter for optimal performance. You will love the quiet and noiseless sleep mode feature which operates in low power mode for those silent nights. The starry night projector can be operated independently of the humidifier which makes it a hit among parents. This technologically advanced humidifier is perfect if you are looking for a high-performance unit. This humidifier is a digital warm & cool mist ultrasonic device that uses high-frequency vibrations to turn water into a fine mist. This creates a comfortable sleeping environment for your baby. You can choose the pre-heating function, and the mist exits the appliance at a pleasant 40°C. A replaceable demineralization cartridge ensures a water mist without lime scale or mineral residue. Other features include self-explanatory LED display, multi-function display with practical reminders (refill water, cleaning required), 3 performance levels, sleep mode for low-noise at night and a timer function. Additionally, it has a high output of up to 3.5 gallons/ 24 hours and whisper-quiet in operation. It has both warm and cool mist mode which makes it ideal for babies and family use. Auto-Mist Technology (AUTO mode) monitors the temperature and automatically adjusts the output when conditions change. It has a digital display and programmable hygrostat. The price point is quite higher as compared to other humidifiers. 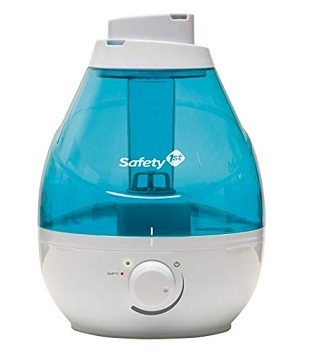 You will love this best-selling ultrasonic humidifier which comes with a demineralization cartridge, hydro cell and EZ Cal which descales and cleans mineral build-up ensuring high performance. 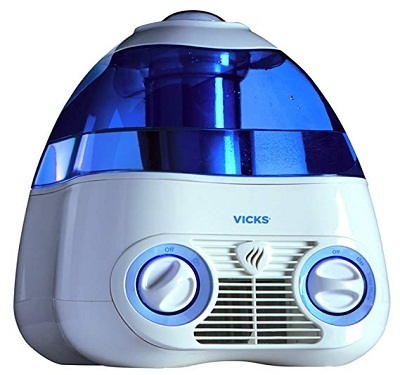 Currently, it is one of the best nursery humidifier available. This top-rated ultrasonic cool mist humidifier by Pure Guardian enhances comfort, helping your baby sleep well. It provides fast relief from dry air, making the room pleasant for babies who have colds, allergies, and dry skin. It features an easy to fill 0.5-gallon tank, ideal for use in small sized rooms. It is embedded with Silver Clean Protection technology which helps fight the growth of mold and mildew on the surface of the water tank. The humidifier gives out a cool, soothing mist. It has a water-level indicator light that tells you when you need to refill the water tank. The nightlight makes the humidifier a great addition to kids’ rooms. It has a space-saving design which is great for small sized rooms. Provides up to 30-Hours of run time on one tank fill. Doesn’t fit under bathroom tap due to its long neck. You will be surprised how low-maintenance the humidifier is. Its superior technology barely allows it to catch mold, thus making cleaning easy and less frequent. Keep your baby healthy and comfortable all year-round with the Safety 1st 360 Degree Cool Mist Ultrasonic Humidifier. It has two mist outlets that rotate 360 degrees and cover the whole nursery. The humidifier’s variable mist control lets you adjust the humidity level easily according to your baby’s comfort. A huge tank lets the humidifier provide cool, soothing mist for 24 hours. It also has an auto shut-off mechanism and an indicator light that tells you when it’s time to refill the humidifier’s tank. A leader in child safety, Safety 1st is here to give you peace of mind so that you can spend less time worrying and more time enjoying with your child. It is noiseless and has no LED or bright lights. It is not suitable for a medium or large sized room. You will its light-weightedness, portability, and durability; that too at an affordable price point. Let your baby breathe easier as this Geniani humidifier fills the room with clean and fresh air making the cold and allergies bearable. Turn on the soft nightlight to lull the baby to sleep. Its 3-liter water tank is ideal for a large room, lasting for 12 hours and up to 24 hours for a smaller room. If during the night the humidifier happens to be out of the water, you can still sleep tight since it automatically shuts down and turns back on only after you refill it. The 360-degree mist nozzle helps you decide in which direction you would like the moist air to be spread. It is twice as powerful as a Regular Humidifier, producing about 250-300 ml of mist per hour. 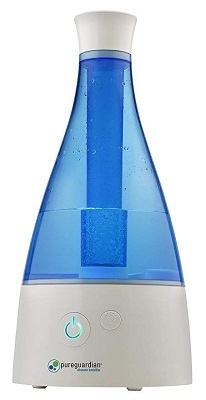 One of the most powerful humidifiers available. Large 3-liter water tank helps it last longer. You need to clean it at least once in 2-3 days. Geniani humidifiers conform to US safety standards which are approved by Intertek certification which will make it your no. 1 choice. Humidifiers for baby rooms are important for newborns babies as they breathe only through their noses for their first 4 – 6 months. Hence, nasal congestion can make breathing, feeding, and sleeping incredibly difficult for your little one. Once you purchase a humidifier, it is super important to be diligent about cleaning it. Pink mildew and molds build up in no time if not maintained properly. One thing that can help is using distilled water only in your humidifier. Although using a humidifier doesn’t make your baby’s cold go away completely, it definitely eases the breathing process and causes a bit of relief.